Açai Berry Soap! I don't really like having to mess with the special ç (it's called a Cedilla just in case you didn't know) so I'll just drop it for this post. Hope you don't mind! No doubt you've heard of Acai Berries and all the wonderful things they can do for your health, especially weight-related. It's being added in all kinds of energy drinks and I suspect in smoothies very soon (if not already) too. It's been used as a flavoring in Brazil for quite some time already. I should mention, the fruit comes from Acai Palm trees which grow in the Amazon rainforest. The correct pronunciation is ah-sigh-EE, but I usually hear people say uh-ki (rhymes with "high"). Regardless of how you say the word, you should get used to hearing it often because it's likely going to join the ranks of such fragrances of pomegranate in terms of fruity favorites. So of course, we had to make some soap! We had grand visions of just how we wanted this soap to look. But the fragrance, as we say in soaper land, accelerated saponification. In other words, the soap got thick, FAST the moment we added the delicious acai scent. Instead of the pretty dark purple and pink swirls with purple jojoba beads, we got basically two layers of the same color light grayish lavender color with the top layer sprinkled with purple jojoba beads. Pam hated it at first. The color was not what she envisioned at all, and she even may have uttered the word "ugly." After we gave it some time to change and do it's thing, unmolded it and dusted it with beautiful pearlescent merlot mica, it was done. It wasn't as we expected, but it actually did turn out quite pretty. The muddy gray-purple is now a soft light lavender color and even though the mica on top washes off after the first use, it is the perfect presentation for a gift. And what does it smell like? Berry! Very few of us have likely smelled an actual acai berry and it's rather difficult to explain: try describing to someone what "strawberry" smells like! I will do my best though. It is sweet, fruity, and a bit like "tropical grape." If colors were scents, this one would certainly be "purple." Of course, the best way to smell this, is just to try it for yourself! I promise you won't be disappointed. Personally, it's my new favorite! The scent lingers on your skin, and I know I've said this before, but it just smells so delicious! Plus, thanks to those jojoba beads, the top half is scrubby and excellent for exfoliating. It lathers beautifully and makes my skin feel fabulous. Try it! 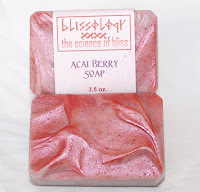 6 Responses to "Introducing Acai Berry Soap"
Wow this sounds like a great soap. That is wonderful that you are making products that will improve your health. Glad to have you in the Artfire community! Michelle - I should make clear, our soap doesn't have real acai berries or extract of acai (we do plan on making a cream with this stuff!) and so the only health benefits are those from all other soaps - they clean! 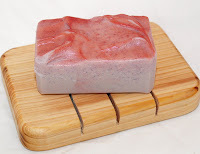 So it won't help you lose weight, it won't give you lots of antioxidants, but because it is handmade soap, it will clean well and leave your skin feeling moisturized, not dry and tight. I really liked your blog and here what I want to add up to your blog post. I am surely going to bookmark it now. I am surrefing from obesity and I keep searchig for good blogs all day. Acai is the berry derived from an Amazonian palm tree with a long history of traditional usage in Brazil. Acial berry diet plan can be really effective for weight loss because of it's antioxidant effects. Acai berries are also said to have many other benefits that include detoxifying the body, improving digestion, boosting immunity, increasing mental clarity, reducing insomnia, enhancing vision etc. It is really pretty sound fact that acai berry is the best superfood for weight loss and anti aging. Acai Berry is a wonderful fruit from the Amazonian rainforest. Being packed with antioxidant, vitamins and nutrients, this nutritious berry has been dubbed as the number one superfood for its potential benefits to the human body. You can visit here for more information.